Participation requires membership, to apply for membership click here or send us an email if you’re a former member. We send out our Art Cards to art directors, publishers, advertising agencies and other specially selected clients. 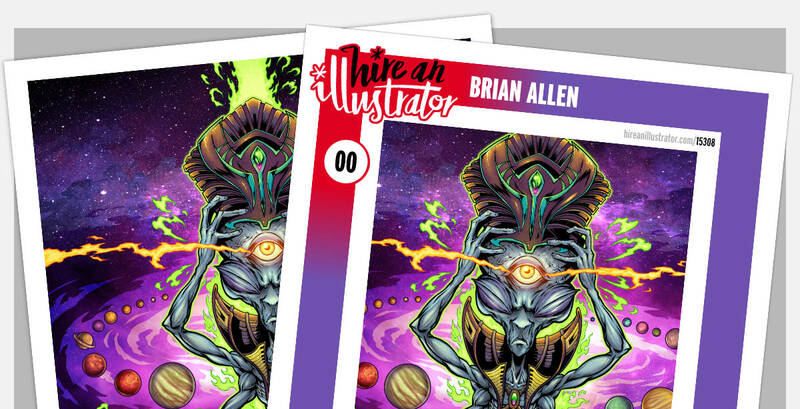 These collectable cards are given away for free to parties who hire illustrators and other creatives. If you would like to participate and become part of our Art Card collection, all we need from you is a 1129 pixel by 1643 pixel or more portrait image with no bleed and a high resolution copy of your artist’s mark, whether that be a symbol, logo or signature. The cost is 29 GBP and we’ll print 100 cards on your behalf that will be given away to our client database for free (including P&P). Additional cards will be available to interested parties for a nominal fee and you’ll also be sent a copy of your own card to keep or share. Our Art Cards are a great way to get your artwork in front of the right people and they have the potential to get you jobs you may not have been considered for via your online endeavours. Artwork – [ PSD | JPG | PDF ] 1129w x 1643h, 300dpi Portrait, RGB, Save as JPG (100%). Artist’s Mark – [ PNG ] 220w x 110h, 300dpi Landscape, RGB, Save as JPG (100%) or PNG. The front of the card will show your artwork in all it’s glory, the reverse of the will reveal all of your essential information with a smaller cropped and framed version of your artwork or illustration. Once your artwork is ready, click the payment link to proceed. If you have any issues with your artwork or our templates, we’re happy to help, all you need to do is get in contact. Please note, sending us an image that is too big is always better than sending one that’s too small. All of the design and formatting is done at our end, so all we actually need is your artwork. Printing, packaging and delivery services are provided by The Little Chimp Society. Now that your payment is complete, please email your files or a link (Dropbox) to your files to darren@hireanillustrator.com Also feel free to use a service like mailbigfile.com or something similar to send your files over. Your website URL and email address will be included on your card, plus the two social pages you appear to be most active on. If you’d like your phone number or specific social page links included, you need to let us know as soon as you put in your order. Please note: The information shown in your profile will be used as part of your Art Card, so please make sure it is correct and current. We will be starting with three collections and adding more as we need them. These will consist of Children’s Illustration, Editorial Artwork and a Science Fiction & Fantasy Collection. Artwork will be selected for a collection based on it’s own merits, we will not be taking requests to be featured in a specific collection. Whether your artwork is numbered or part of an open edition will be at our discretion. We’ll be sending out 50-60 Art Card packs per month. Clients will be sent different collections based on which collection is most relevant to the field they work in. We have a very large international database of client contacts that we’ve been building for over 10 years now. It’s constantly being added to and updated to make it as reliable and useful as it possibly can be. Every client on our list is verified and we’re in contact with them before we mail them our physical promotional material to make sure we’re not wasting our resources or time. We previously sent out traditional promotional postcards to art directors as part of our mail shot packs. The reason for the change to Art Cards is to prolong their longevity and create something that clients will want to keep and even acquire when they have cards missing from their collections. 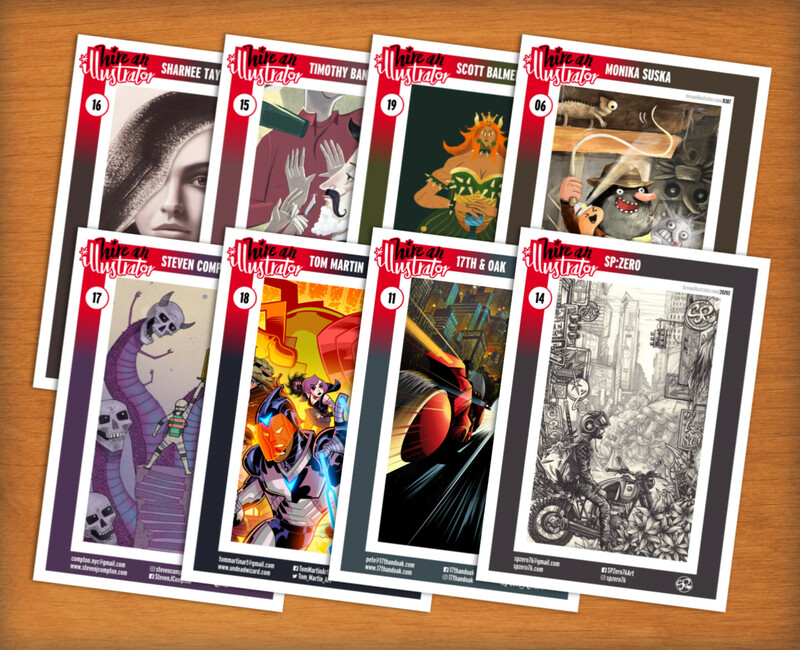 If the Art Cards are popular enough, we may release a mini version (business card sized) and an annual or bi-annual magazine featuring our members’ Art Card artwork. There will be no extra fees for being included in these additional collections, but we may charge interested parties for copies if they have no intention of hiring one or more of our members. Although we will be producing beautiful collectable products for consumption, the function of the Art Cards is still the promotion of our members, with the aim of getting their work in front of clients who commission freelance illustrators and artists. Also, we’ve not forgotten about our members who are now focusing on Patreon and crowd funding using the likes of Kickstarter to further their careers. We will be integrating those methods of commercialising your artwork into our marketing too, to make sure that everyone is still getting what they want or need from us as a freelancer.